Minimum 2 passengers (adults) is required for the tour to run. "La Nueva Guatemala de la Asunción" is the name of the city of the Republic, is also the center of negotiations, religion, and the center of cultural activities. This metropolis, of about 4 million people, has a panoramic contrast between the colonial architecture that is combined with modern buildings, with its important museums and historical monuments, offers visitors a unique experience. 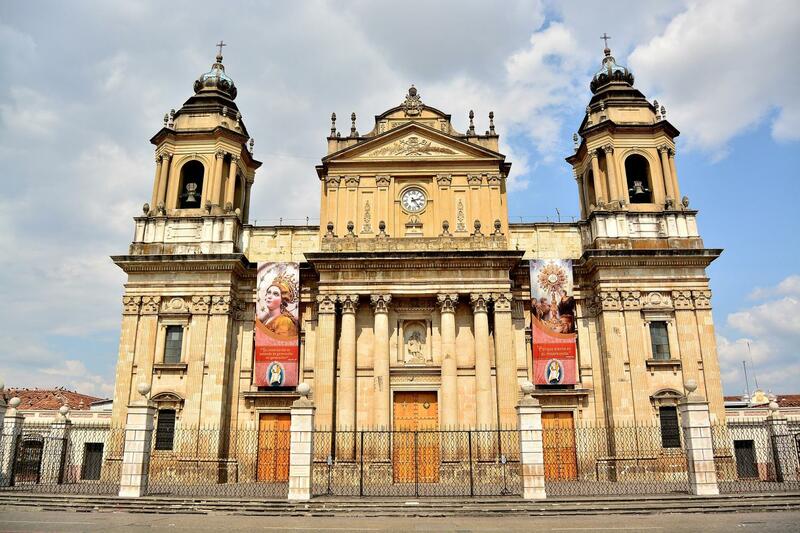 Your tour begins with a pick-up at your hotel for a tour of Guatemala City. First we will visit Las Americas Avenue, which is named after the reform drawn in the late nineteenth century, due to the formation of the Organization of American States on April 30th, 1948. The area comprising of the Avenue of the Americas was demarcated in several farms in the early decade of the 50’s with the intention of dedicating land to the American continent. We will then continue to the Civic Center of the City, a set of buildings constructed between the 50’s and 60’s and includes: the Supreme Court of Justice, the Ministry of Public Finance, City Hall, the Social Security, the Bank of Guatemala, the National Mortgage Bank, and the Guatemalan Tourism Commission. The Bank of Guatemala is decorated with high relief murals by Dagoberto Vasquez describing the history of the country, and also includes a mosaic by Carlos Merida. Next we continue to the Major Plaza of the Constitution. This Plaza is the heart of the Historic Center of the city. It is surrounded by important monuments such as the National Palace (now the Cultural National Palace and museum), the Metropolitan Cathedral, the Portal of Commerce and Centenarian Park. A few steps away are the National Library, the Periodicals Library and the General Archive of Central America. The tour includes a visit to the Central Market, which is located behind the Metropolitan Cathedral, in the basement of the Tabernacle Plaza. There, visitors can buy a variety of art and handicrafts from all over the country; ceramics, textiles, leather, wood, and silver. The tour concludes at Paseo Cayala, from this point we make our way back to the hotel. Feel free to stay here as long as you'd like and return to your hotel on your own later on or continue to the hotel. The tour guide and driver were excellent and so knowledgable and informative on everything about Guate and Chapinlandia! Great for anyone from a first time visitor to a person wanting to learn more about Guatemala. Excelente Servicio. Amables y muy puntuales.